...but the cancellation of the announcement doesn't mean that the tax rise itself has also been cancelled. Read Ben Brogan's hugely plausible account of the behind-the-scenes differences between Brown and Darling. "This is Labour's secret tax bombshell. It explains why there is a black hole in the PBR. Because at the last minute Gordon Brown clearly decided to keep secret his plan to hit everyone with an extra tax rise to pay for his borrowing binge. Gordon Brown told us that he would have no “hidden manifesto” and that “everything is above board”. But these documents show that Labour was planning to deceive the British public, and will raise VAT on everyone after the election. Labour have a secret tax bombshell set to explode under the British people if they ever get re-elected. It tells you all you need to know about Gordon Brown and Labour." Shouldn't Timms have read the document before signing it? What else has been signed into law 'by mistake'? Timms and/or some of his staff need to take responsiblity - heads to roll. 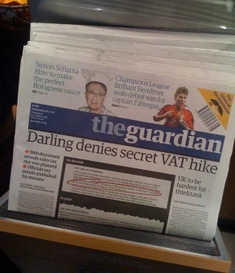 Glad to see that you just took a photo of The Guardian on the newsstand -- and didn't acutally buy it! We should not be taking our eyes off the birdie. I am very very nervous that we dont "overplay" this! Anyone who has ever dealt with legal documents knows that you prepare drafts - they will,as they have,admit it was an error - we will claim it hides a hidden agenda - in reality BOTH are true - they did look at it - they did initially discount it! (1) we have to begin to focus on what we will do - not continually what we have done! (2) we must not fall in to the trap of focussing too long on VAT - it wont take Campbell long to trawl up evidence of DC involvement in his youth with the record rise of VAT under us! - we've made the point - lets leave it - dont overplay it now - wait for the election! I don't think you can overplay this at all. It clearly shows the advanced stage of the kind of future tax hikes that Labour is considering. Also, please,please release a chronology of Labour's previous growth estimates and later revisions, and show what applying the same % average error would mean to the total debt projections (with a per taxpayer liability). I am sure that there are all kinds of "models" at CHQ with tracking of the economic,fiscal,poll impact of tax increases on VAT,NI,Income Tax etc - those models will go from the simple to the ridiculous. Draft documents,as those who use them like I do are a nightmare - the more you have,the more the risk that they get out - The Treasury has given us a simple own-goal here - lets milk it like we have done,but lets NOT overplay it - thats my point! Dont give the opposition a pelting with stones when they will TRY to lob grenades back! The point has been made,the friendly media have been receptive. What we do desperately desperately need from GO today is some policy - NOT specific but just something constructive and NOT the usual shrill negativity! "Darling denies 1% VAT hike"
Pass the salt please, I need a bigger pinch of it ! There's a couple of things I learned about Labour these last dozen or so years and that is that they can't lie straight and are not to be trusted. A VAT rise is a perfect Labour remedy which could be sold to the electorate on the back of only those with the ability to pay will pay it, "and of course it wouldn't apply to essential services like gas and electric so we're really looking after people". They should be outed for many reasons but notleast because they are incompetent liars. Also, I heard that Alistair Campbell fellow ( pah ) last night on Newsnight, saying "If Blair had been elected at the last general election and was still in office then he would have agreed with the top earner tax rise". Jermey Paxman let the bloke get away with that and Nigel Lawson probably missed it, but I wondered how many people actually did comprehend the bold lie ( or uncorrected mistake if you prefer ), that would otherwise lead a watcher to think that Brown had been elected at the last election not Blair? Spin on top of spin and the BBC are culpable assistants to the Labour spin doctor who a ) has no right to be appearing, b ) Isn't and never was an elected official, and c ) Has a blatant skew on politics to place Brown's idiotic policies in good light! The question is not IF but when in respect of Labour's tax rises and VAT is the most likely candidate IF they were ever to gain control of government again. Geoffrey Howe increased VAT from 8% (the reduced rate on basic goods and services) and 12.5% (the basic rate on luxury items) in 1979 to 15% (for both rates); which Norman Lamont increased in 1991 to 17.5%. I fear that our delight at these theoretic 18.5% revelations are therefore opportunistic. The Government is actually cutting VAT 'back' to 15%. This all completely misses the point. VAT (as well as the other forms of tax) should be as close to nill as possible - taxation is legalised theft. This mafia state we live in takes its cut of every transaction we make. We should stop deluding ourselves we are still a free people. A Conservative Party worthy of my aspirations would not be able to sleep at night for planning how to return our money back to us. Where is the passion in our disgust at what the country has become? I have yet to live under a Labour government that knew how to run the economy; this one is no exception to the rule -- only worse.